When is the AF going to smarten up about how they compute these test results, especially for personnel on medical waivers/profiles? We have great workers in this unit who are on PT profiles and can’t do anything but a waist measurement; this test is the most unfair method I have ever seen. With the AF maximum waist measurement of 39 on the single component, it is unthinkable why it takes a 37.5 to obtain enough points to pass when that is the only component a person can do. This 37.5 does not take into account anything such as how tall a person is, their body composition or their age. If on the same profile, how does a 67 inch tall 20 year old male have the same criteria to pass a waist measurement as a 72 inch tall 38 year old male?? This makes no sense, but our unit and I’m sure others across the service are doing nothing to correct this injustice but rather taking all steps possible to detrimentally damage a person’s career to the point of discharge. 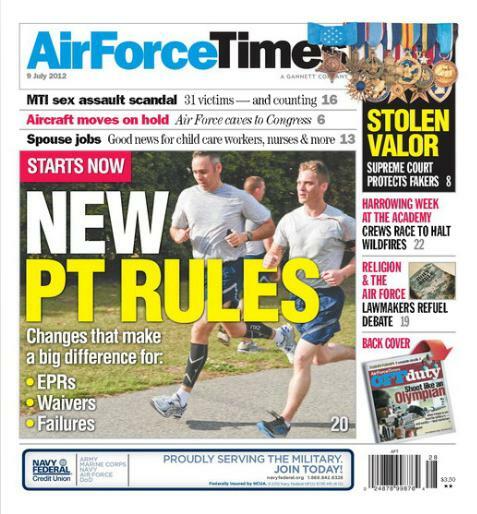 I personally have never failed a PT test; I just hate to see the climate of this organization so negatively affected by one small standard that has in my opinion been used as a “Force Shaping Tool”.